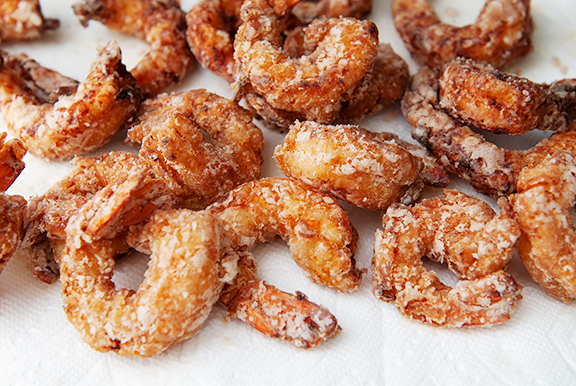 As I mentioned above, the shrimp are dredged in potato starch before frying. You could use cornstarch, but potato starch is my favorite for the light crisp finish and the fact that the coating retains a good bit of crunch when you reheat leftovers in the oven. I even cut half of the flour in my tempura recipe with potato starch because it results in a better texture. The finishing sauces require a tiny bit of effort. 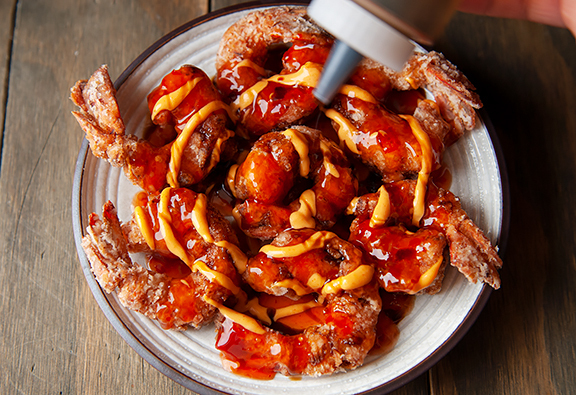 I find that Thai sweet chili sauces are a little too thick for this dish straight out of the bottle. 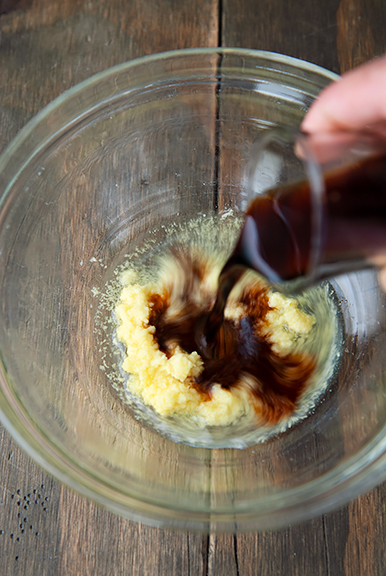 We want to be able to drizzle, not glop. I mix equal parts sweet chili sauce with water and stir over medium heat until it comes to a boil. This will thin the sauce enough to pour it over the fried shrimp. 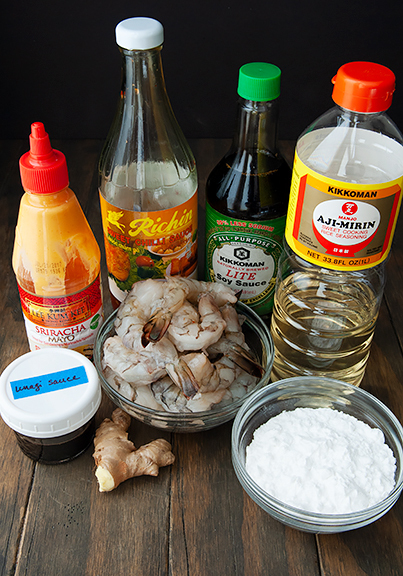 Sriracha mayonnaise and a sweet and salty unagi sauce (the sauce used on Japanese barbecue eel) can be found in Asian grocery stores, but if you don’t have access to these, you can just as easily make them from scratch with more common grocery items found in Asian and western grocery stores. I list the recipes for these in the main recipe below. 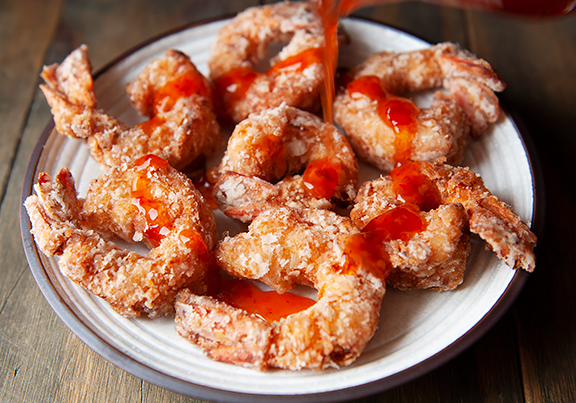 And despite the order I’m showing in the blog post, I typically get the sauces ready before I fry the shrimp so that the shrimp are as hot and freshly cooked as possible when I serve them. 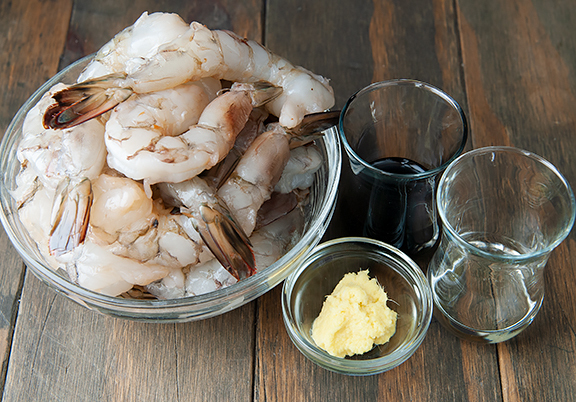 I used fresh shrimp in these photos and recipe tested with frozen shrimp. Both are excellent, although the fresh shrimp really knocks it out of the park. Not surprisingly, a little goes a long way here. The sauce is in no way traditional, but it is absolutely delicious. You can taste a hint of brightness from the ginger underneath the sweet, spicy, umami, tangy, creamy whirlwind happening in your mouth. 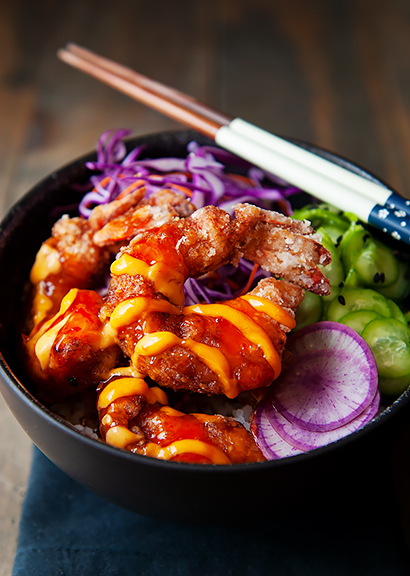 And of course, my favorite texture combo in the world is crunchy goodness dipped in sauce. My eyes want to eat a dozen, but I start slowing down after three of these flavor-packed babies. 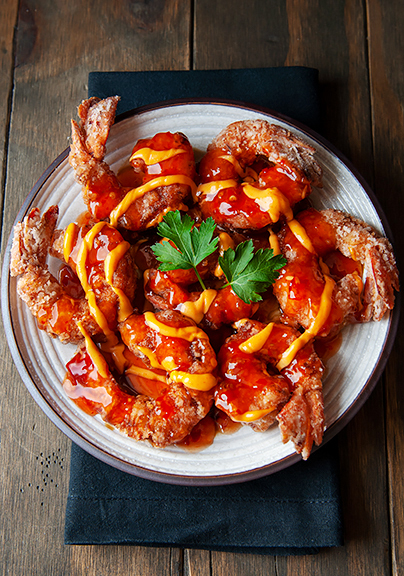 These shrimp tatsuta-age make the perfect appetizer, or plop a few on a bowl of steamed rice with some vegetables and you have yourself a lovely, tasty meal. 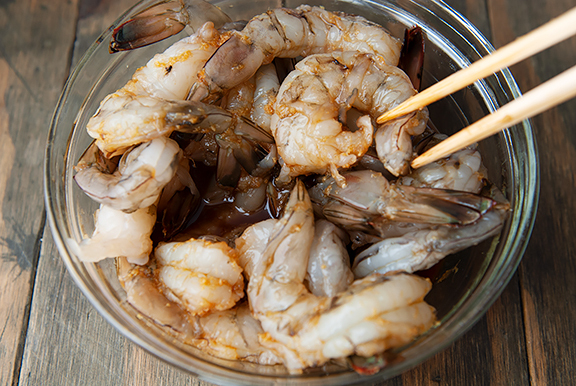 Make the shrimp tatsuta-age: Marinate the peeled shrimp with the soy sauce, mirin, and grated ginger for 5-10 minutes. Place the potato starch in a wide bowl and set aside. 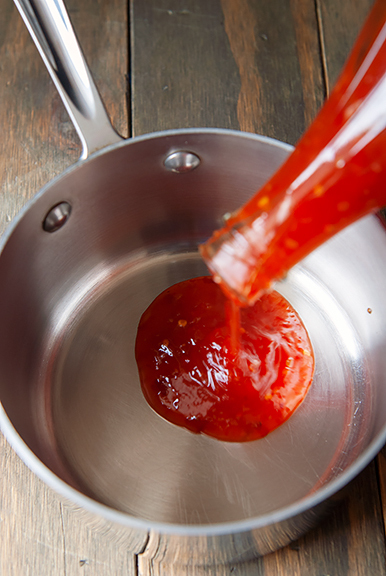 Stir the Thai sweet chili sauce and water together in a small saucepan over medium heat and bring to a boil. Remove from heat. 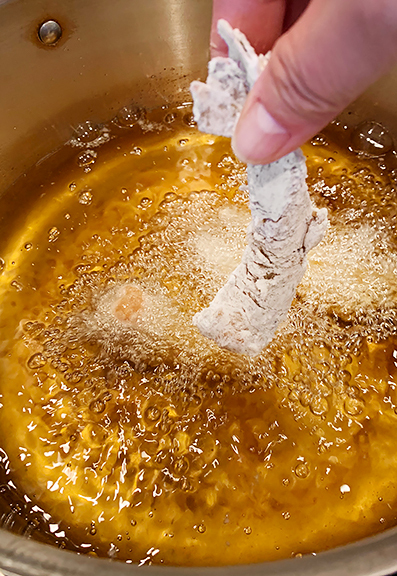 Fill an inch (or more if deep frying) of vegetable oil in a frying pan or a stock pot over medium-high heat to a temperature of 350°F (333°F at 8500 ft.). 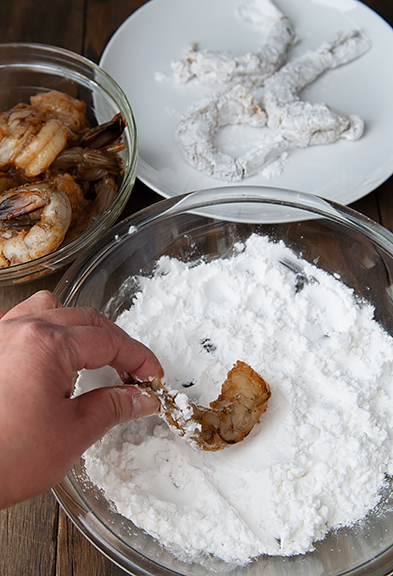 Coat each shrimp in potato starch. 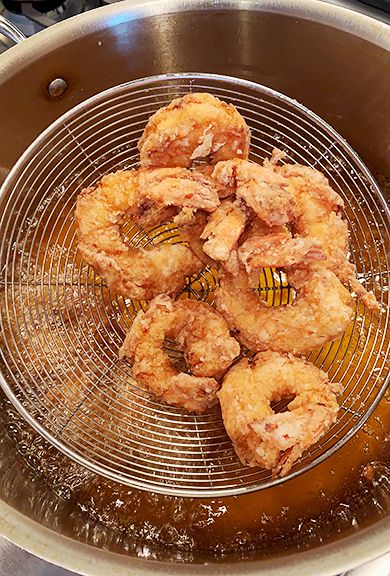 Fry the shrimp in the hot oil, taking care not to overcrowd the pan (fry in batches if necessary), for 2 minutes a side until the shrimp are golden in color. Remove to a paper-towel lined cooling rack to drain. 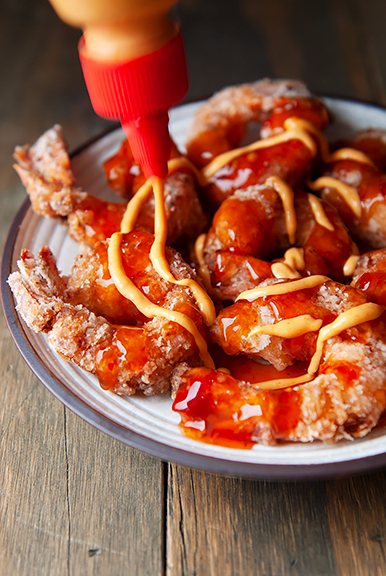 Arrange the shrimp on a plate and pour the Thai sweet chili sauce over the shrimp. 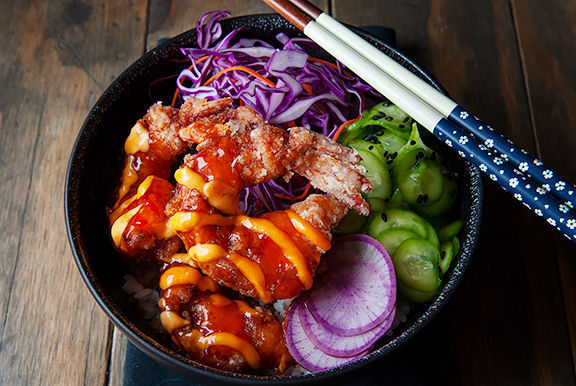 Drizzle the sriracha mayonnaise and the unagi sauce over the shrimp. Serve immediately. 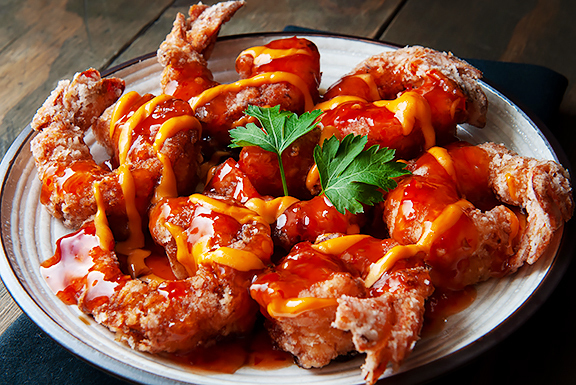 Wow, what a gorgeous, delicious-looking dish! If Jeremy loves it so much, I suggest a trade. Ten shrimp for one clean, organized room. Hahaha. Ok, we really enjoyed the first recipe, so we need to try this one. I will invite our daughter over because she is a shrimp fiend. I attacked my husband’s workbench area in January. 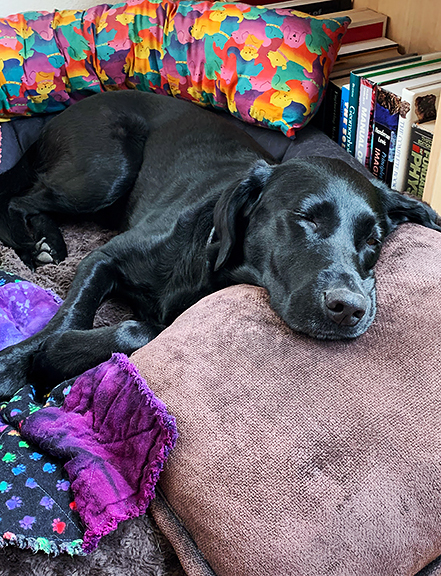 He is a saver, and isn’t great about putting things away when he is finished with them. I threw away what I KNEW was trash, organized by item, labeled, and was left with oodles of things I couldn’t identify. I would bring up an assortment every evening and let him go through it. It took a while, but it was the only way I was going to get him to do it, and now I can find tools when I need them!! Who knew one household could have so many drill bits. 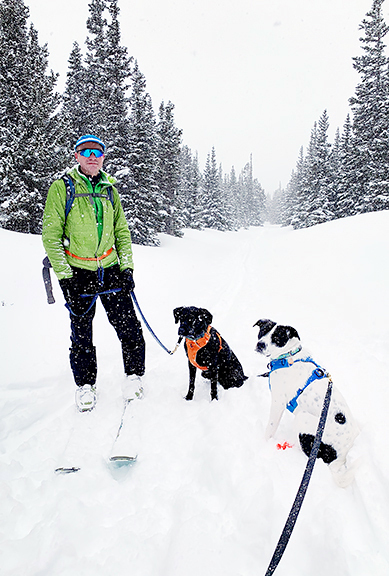 I look back to how we had absolutely nothing when we got married 30 years ago and wonder where the heck it all came from. Long story to say I agree that your approach is the way to do it! will try cooking the shrimp by that method. I like the purple radish slices. 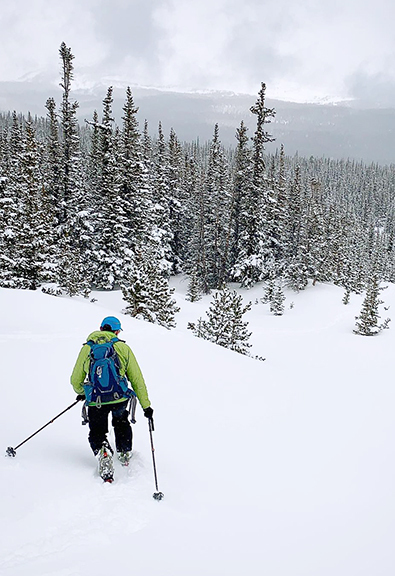 Potato starch? I’ll keep that in mind as we love fried shrimp and fish. 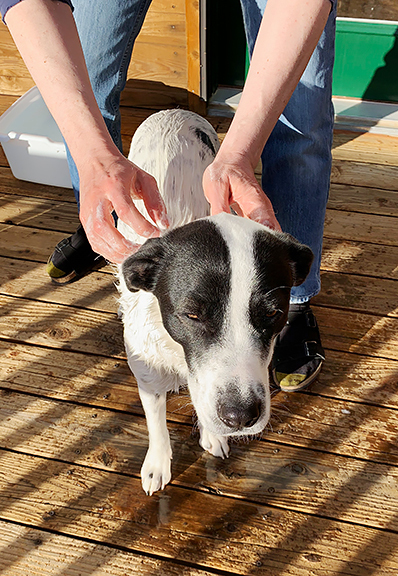 Summer is frying time at our cabin because I can do it on the deck. I am in a similar “struggle” with home organization. With a husband of similar thinking.